My Family Meal Planner Light plans your meals for an entire year. My Family Meal Planner Light In the My Family Meal Planner Light app you will find: • 4 meals planned per week for 52 weeks, all the recipes you need, and all the weekly grocery lists. 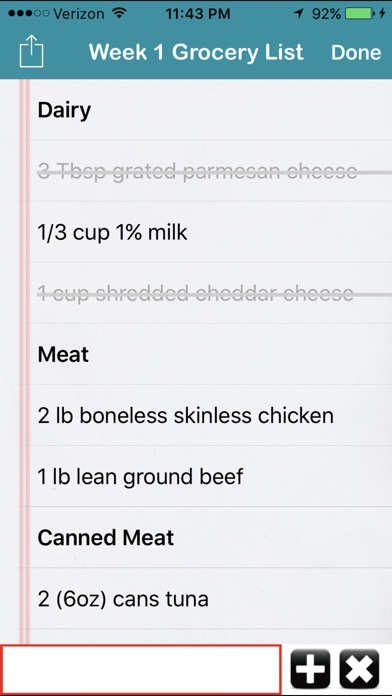 • An interactive grocery list that you can cross off items and add your own items. • All meals are under 500 calories. • Every recipe and meal includes nutritional analysis. • You will have one slow cooker meal every week. There is a picture of a slow cooker next to the menu/recipes that are slow cooker meals. • All recipes or menu items that have a heart by them meet the American Heart Association requirements for a heart healthy recipe/meal. • All recipes or menu items that have a star by them are diabetic friendly. They have less than 60 grams of carbohydrates per serving or less than 4 Carb Choices. 1 Carb Choice = 15 grams of Carbohydrates. Recommended amount for most diabetics is 3 to 4 carb choices per meal. (If you are a diabetic, make sure you follow your individual plan made for you by your doctor or dietitian.) **If carbohydrates are close to 60 grams, omit the fruit in order to have your glass of milk with your meal and to stay within your 3 to 4 carb choices per meal. • If you are using a weight loss system that uses points, you will see at the bottom of the nutritional analysis your points already figured! This meal planner is not intended to be a weight loss plan. (This meal planner is in no way affiliated with Weight Watchers International and it has not been reviewed by Weight Watchers for accuracy and suitability for Weight Watcher members.) • When I wrote this meal planner in 2008 I was a childcare provider. I was required to follow the USDA requirements when feeding the children in my care. I felt it was important to include these requirements in this meal planner. You and your family will receive 1 meat, 1 bread, either 2 fruits or 2 vegetables or a fruit and a vegetable at every meal. You will receive Vitamin C daily and Vitamin A at least twice a week. They also suggest that you drink a glass of milk with your meal. You will save money in the end because you are going to the store with a list. You won’t be buying unnecessary items. Many of my customers have reported saving $75-$100 a month. Plus they are saving time because they don’t have to figure out their menu. I have already done it for you! A few things to remember before heading to the store: • Items on the menu that include a recipe you will need to refer to that recipe for the serving size. All other sides are ½ cup servings except side salads are 1 cup servings. • If you would like to have margarine on your bread and/or salad dressing on your salad, you will need to add that to your grocery list and be sure to add the calories to your meal. Use these two items sparingly. They are usually full of calories and fat. • I used canned fruits for the nutritional analysis so that it would be convenient for you, but you can purchase fresh fruit instead. • For the nutritional analysis I used ground beef 90% lean meat/10% fat. For milk I used 1%. I also used instant mashed potatoes for figuring purposes. For many of the items you can find lower calorie options. Feel free to purchase those items. The nutritional analysis figures for this meal planner were figured based on the USDA ingredient database. Nutritional values will vary from brand to brand. 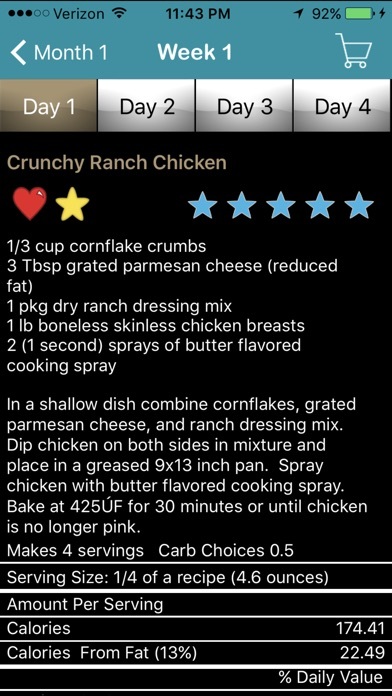 I hope you enjoy your My Family Meal Planner Light Mobile App! I was under the impression that the app was to plan my family’s daily meals. It isn’t. It’s pre-populated. I’m in the process of seeking a refund through apple - but the app may not be refundable. Meal Planning Made Super Easy! Love this app! It has all the meal planning, recipes, AND your shopping list all taken care of!! You can even export the list! 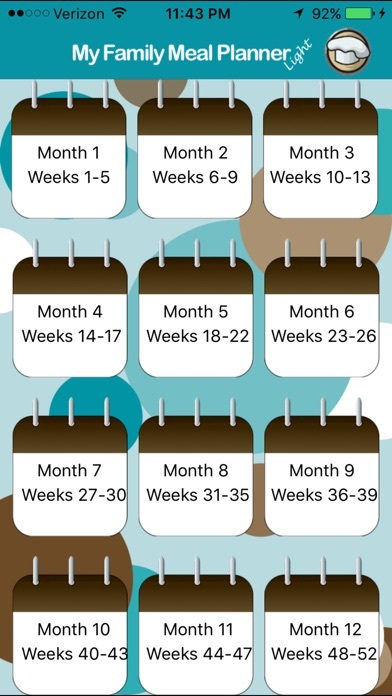 This has been so helpful for our busy family! This app cost $4.99. So don’t pay attention to the other bad review that said they were charged and got mad. Of course they were charged, because it costs. The app itself is great I love it. It makes meal planning easy. The Meals are simple and quick to make. They are not fancy. So if you want to fancy food this is not the app for you. But if you want simple good food for your family this is definitely the app for you.The shopping list makes things really easy. I like that each meal includes a protein carbohydrate veggies and fruit and if you want to add milk to each meal it is supposed to provide a nutritious meal. We don’t drink milk but we followed the other guidelines. We’ve only done it for one week but I can say that meal time has been a whole lot less stressful than usual and grocery shopping has not been a headache. I think it’s worth the money I spent on it. Love it! Love it! Love it. Watch out for false charges!! Scam!!! I downloaded this free app yesterday and clicked on the app today selecting nothing and now I have a $4.99 charge on my iTunes account that I did not authorize! Check your account people this app is a scam. Working single mom with no time to meal plan, it even saves at the grocery store, time and money! I absolutely love, love, love this app! I'm on month 2 & I haven't came across a meal that me or my family hasn't liked!! The only thing is I wished there was an app for breakfast & lunch too! I love knowing what I'm going to make, so easy in today's busy life! Thank you for making my life a little bit easier!! I absolutely LOVE this app!! Makes it so much easier being a busy mom of four kids always in a sport. If you are not looking for a planned menus I wouldn't download this app as it states in the details of this.... 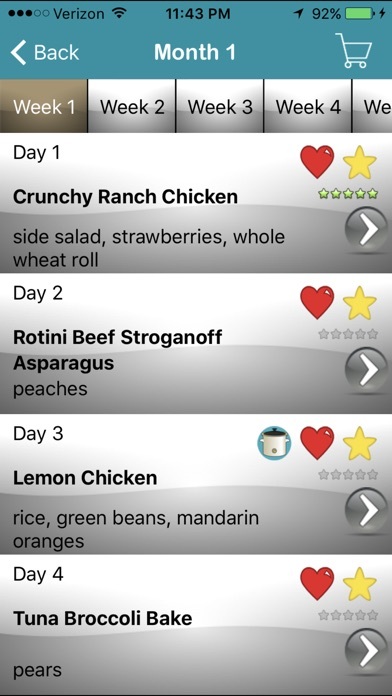 I would HIGHLY recommend this app to anyone who is busy and looking for help with meal ideas or a meal planner. The meals are already chosen for you. I want to choose what my family is going to not someone who doesn't even know my families likes and dislikes. We like the different meals and that they are laid out for the week. I love this app it's exactly what I need. I don't have time to planner and make shopping list but the app does it all.